With 7 weeks to go until the Weston A. Price Foundation‘s 2012 Wise Traditions conference, The Appropriate Omnivore continues its series of Wise Traditions speakers. 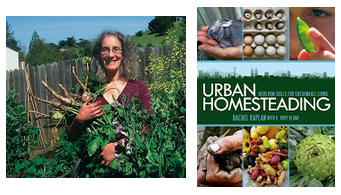 The speaker for this episode is Rachel Kaplan, co-author of the book Urban Homesteading: Heirloom Skills for Sustainable Living. Just what is urban homesteading? Rachel explains how urban homesteading applies to food and to an overall lifestyle. She talks about how she balances being an urban homesteader, giving lectures and writing about it, while also working a full time job as a marriage and family therapist.